Bowl Season is inching closer, the 2017 College Football season regrettably is coming to an end. The last game of the season will feature two conference champions who were not voted into this seasons College Football Playoffs in favor of non-conference champion Alabama. Even though neither team isn’t a part of the big dance, it does not mean that this game will lack the drama, the intensity, and the sizzle of the teams that made it. The BIG 10 Champions, the Ohio State Buckeyes finished their regular season at 11-2, with losses against Oklahoma at home by 15 and at Iowa, by a whopping 31 points to an above average team. The Iowa loss was the Buckeyes worst conference losses to date, that I could recall, but that was the factor that eliminated them from the conversation. The 11-2 USC Trojans were never really in the conversation even though they were crowned as the PAC 12 Champions. They suffered both of their losses on the road, to Washington State and Notre Dame. Their losses were not as bad as Ohio State’s, losing to Washington State late, by a FG and a 35-point throttling at the hands of the Irish. Both teams have a lot to prove, and with an abundance of NFL talent on each team, this is a must watch. Both teams were pre-season favorites to make the playoffs, but things happen as both are aiming to finish this season on a high note with a victory in Dallas. 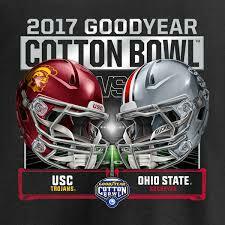 Head-to-head, USC has won 13 out of 23 contests against Ohio State’s 9 and a single tie. USC has won 7 straight and is looking to add an 8th consecutive win at the Rose Bowl. Ohio State’s last win against the Trojans was back in 1974 under Woody Hayes. Both Ohio State and USC have a playmaker at every single level, but both teams have studs at the QB and RB positions, which will most likely attract scouts to the game. On one side you have a surefire first round pick in Sam Darnold, a RS Sophomore and Junior Ronald Jones II competing against Fifth Year Senior, J.T. Barrett and RS Sophomore Mike Weber, with J.K. Dobbins, a talented True Freshman in the rotation. In Darnold, you have a talented QB capable of making plays on the fly with his arm. For the season he is 277-435 and has thrown for 3787 yards, 26 TD’s against 12 INT’s, with 100 yards on the ground and 5 TD’s. He has a lot of talent around him at WR and TE that could give the Silver Bullets fits. With Barrett, he is a dual-threat that tends to take over during crunch time. He is 229-354 for 2939 yards with 35 TD’s and 9 INT’s. He also has rushed for 732 and 10 TD’s. He holds a variety of BIG and NCAA records, but he is a long shot in this years draft to make in on an NFL roster. Barrett has weapons at WR and TE, but they aren’t as established as USC’s is, but they can flat out fly past defenders and make people miss for yards after the catch. In the backfield, Ronald Jones is a load at running back with 1486 yards and 18 TD’s for the season. Ohio State has a two-headed monster in Mike Weber and J.K. Dobbins, who combined for 1972 total yards rushing and 17 TD’s, with Dobbins becoming the the 4th Freshman at Ohio State to break the 1,000 yard mark and surpassing Weber’s mark from a season ago. Both teams will try to impose their will against each others defenses and it will start with these two positions. Neither team can afford to start out sloppy because the game could get out of hand quickly. Turnovers will give the other team the edge. QB: Objectively, I will give the slight edge at this position to USC. Yes, Darnold is prone to turnovers, but like we saw against Washington, he is elusive in the pocket and has the awareness and accuracy and arm strength to get out of trouble. I love Barrett, but his accuracy has been an issue this season and throwing just isn’t his strength. RB: Ronald Jones II is a beast, but the depth isn’t there. Carr is a good player, but I will give Ohio State the edge at RB. J.K. Dobbins has been a pleasant surprise this season and leads the Buckeyes in rushing, but Mike Weber has also come on as of late. Together, they make up one of the best duo’s in College Football, and they are both looking to tear up this USC defense. 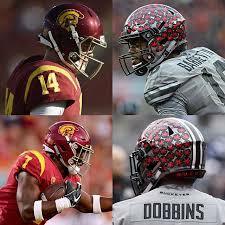 Jones is an all-purpose back, but so is Dobbins. The deciding factor is Weber’s ability to run north and south.